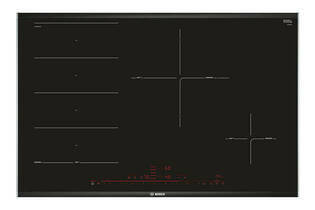 Snapshot: The Bosch PXE875DC1E induction cooktop has 4 cooking zones, which can be configured as a flexi-zone. How well does it cook? Has 4 cooking zones in a range of sizes (can be configured as a flexi-zone). Good cooking zone layout (small zone at front, large zone at rear, flexi-zone on left side). A sensor automatically controls the temperature to ensure optimal frying results. Cooking zone dimensions are not well marked out.